That’s my lovely new iPad 2 Smart Cover up above. It’s one of the newly added dark gray polyurethane models. I’d been wanting to try out one of the polyurethane models for quite a while, as I’ve only ever used the leather one I bought on iPad 2 launch day. I took the new smart cover out of its box two minutes ago, and figured I should grab a photo of it while it as clean as it will ever be. So far I quite like the dark gray – though it’s too soon to make any comparisons on using the polyurethane as opposed to the leather one of course. If I spot any interesting differences in using this new model I’ll be sure to share some thoughts on them here. I purchased a leather cover when they were first made available. Unfortunately it has started to come part at the seam where the hinges connect. This has caused the cover to be out of alignment with the magnets rendering the cover on/off feature useless. Any early thoughts if the new covers will have the same issue? My leather smart cover is a little bit frayed at some of the bottom edges, but it has had no impact on alignment or magnets so far. As for the question, no thoughts yet on that – have had it on for less than 24 hours. I’ll share more thoughts on it when it has been on for a few weeks. 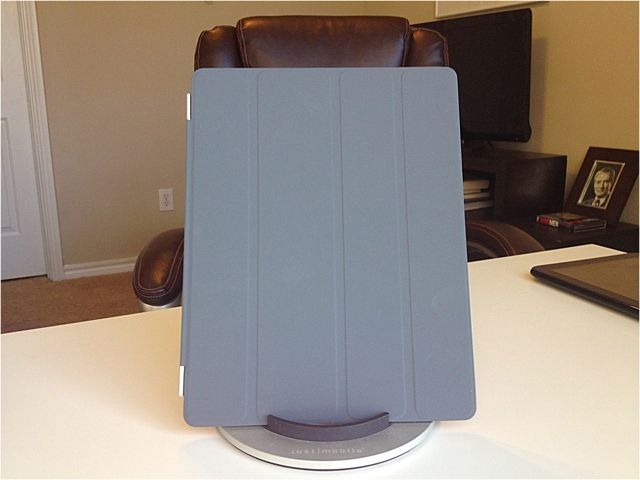 I have the medium gray polyurethane Smart Cover. I’ve had it for about six months, and it’s holding up well. It’s understated, so the iPad never stands out in a crowd. And it’s understated, so the iPad doesn’t stand out when I’m looking for it. That’s a pro and a con for the same feature. I generally don’t like my electronics to attract attention, so I’m not disappointed about that. My only complaint is the cover sometimes falls off, but it’s easy to slap back on, so it’s not a huge issue. Hmmm – I’ve never had any issues at all with the leather cover falling off. I hope that’s not a ‘feature’ of the polyurethane model. What is the iPad stand in the picture? I need one that will hold it upright in portrait mode like that!